Are you looking to build your own energy efficient, eco or sustainable home? Are you happy where you are but are looking to achieve the highest standards of energy efficiency in your property? If so, the Passive House standard is for you.Passive House (or Passivhaus) is a building standard targeted towards achieving more with a building with less energy. Passive House is a performance standard for comfortable buildings with exceptionally low energy consumption requiring both quality construction and well-built components (such as thermally efficient windows) to achieve. It is not a specific construction method so the appearance of a Passive House can be decided by the Client/Architect. Passive House buildings are required to meet specific energy demand targets but the standard is not prescriptive as to how this must be achieved. What sets a Passive House apart from a conventional building? 5. Well insulated window/door frames with triple glazing. 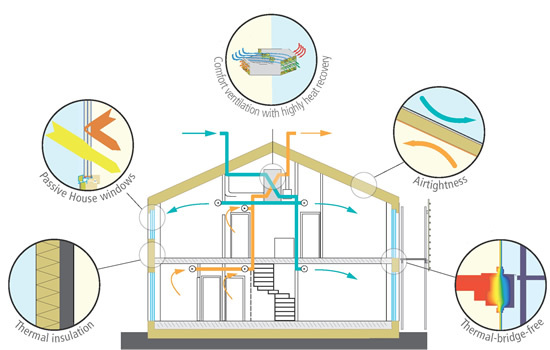 Passive houses use efficient ventilated heating systems to ensure high indoor air quality, accounting for factors such as internal air temperature, internal surface temperatures, moisture levels and fresh air ventilation rates/air exchanges. This is as true in the depths of Winter as at the height of Summer, where a Passive House building will still require only low levels of energy for heating or cooling respectively. The aim of the standard is a fabric first approach to keep energy requirements low. An individual Passive House is optimised to meet the local conditions such as weather (sun, wind, rain) and the local environment (shading from trees for example). In the UK we have a greater focus on issues relating to moisture than in a drier climate where the approach may be more focused on passive cooling. The Passive House standard requires that no more than 15kWh is required to heat/cool each square metre of living space per year. This equates to roughly 1.5 litres of oil and a more than 90% reduction in space heating/cooling for typical existing building stock. By comparison, a conventional new build could still require 6 – 10 litres of oil per metre squared per annum. As you can see, Passive House buildings are significantly better optimised than a conventional build. If you are interested in building or retrofitting your building to Passivhaus standard, then please get in touch with us by phone: 01454 324807, email: contact@greenleafinnovations.co.uk or use our Contact Form.